It’s time to shop!! Yay! The MFT February Release is now available for purchase!! 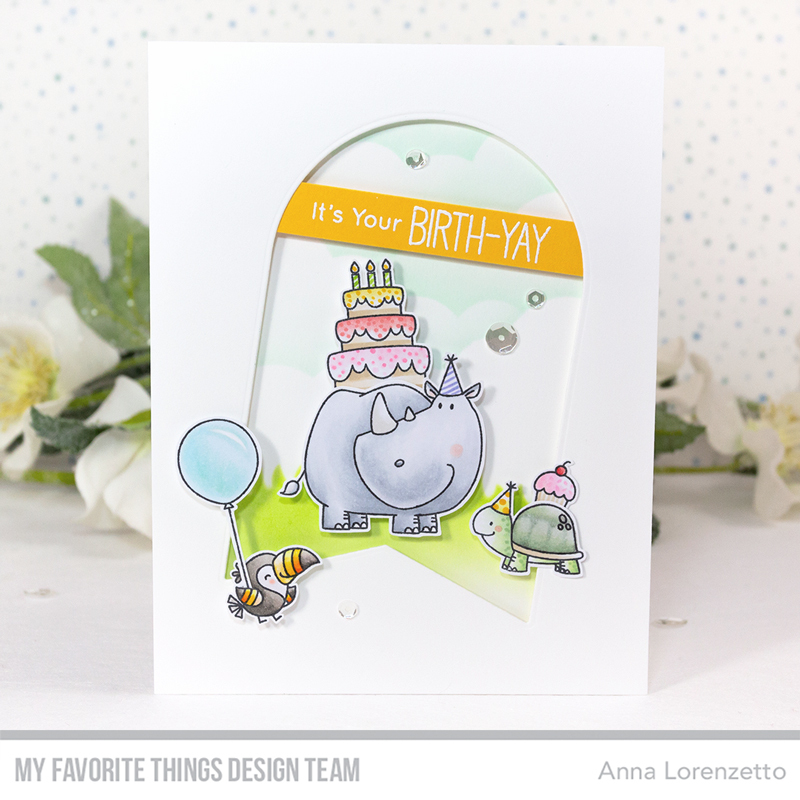 Today I’m sharing a new card featuring the Birth-Yay Stamp Set along with the Tag Builder Blueprints 7 Die-namics. These adorable characters are so fun to color and I’m sure you’re going to love them! :) They’re just perfect to design funny birthday projects for all of your favorite people. To begin, I colored the individual characters with my Copic Markers and carefully fussy cut them – but you can use the coordinating dies as well. Then, I die-cut the tag out of a white card stock panel, creating a window where to place my scene. To create the background, I ink blended some Twisted Citron Distress ink over the Grassy Edges Stencil to create the ground and some Cracked Pistachio Distress ink over the Cloud Stencil for the sky. I mounted the front panel and all the characters on my card base, using foam tape for dimension. I heat embossed the sentiment in white on a strip of Lemon Drop Card Stock and added some sparkling clear sequins as embellishments. Be sure to check out the MFT Blog for a closer look at the new products and see what the other DT members and guest designers have created for today! So cute! Love the wonky placement of the aperture, I would never have thought of that! Beautiful project with the blueprit tag builder. great release. Love the clean and crisp look of your card! Your choice of subtle colours is wonderful! Great colouring of critters! I really like how everything is a bit askew in this. It gives such a sense of movement and fun to this card. And your coloring is lovely. Thanks for sharing with us! Love how you used the negative aspect of the tag to frame your stamping. Great idea! I love your adorable card. Great card design! Fabulous card! Lovely design and such a sweet scene. I really like the sentiment that you chose for this card!!! So much-funyay!!! Cute animals and love your coloring! What a whimsical card you created using the Tag Builder Blueprints 7 Die-namics and the Birth-Yay Stamp Set. It’s sure to bring a smile to the lucky recipient’s face! So cute!! I love the angled opening. Fabulous idea! This is absolutely adorable and that coloring is magnificent!!! Love how you used the tag did to make a window also!!! Thanks so much for sharing!! Your card is adorable! What a happy group of animal friends! I like how you used the shape die incorporated into your card front. Love this! I especially love how you made a window with the tag, genius! Adorable! Your cards make me smile! Love your clean style and copic skills! Great card! I love how you created a clever window by using the new tag die. I adore these character, and what a creative way to use the tag die! So cute!! I love how you used the tag die to create a window for your scene! It’s a really cute card and you can never go wrong with a BB stamp set. 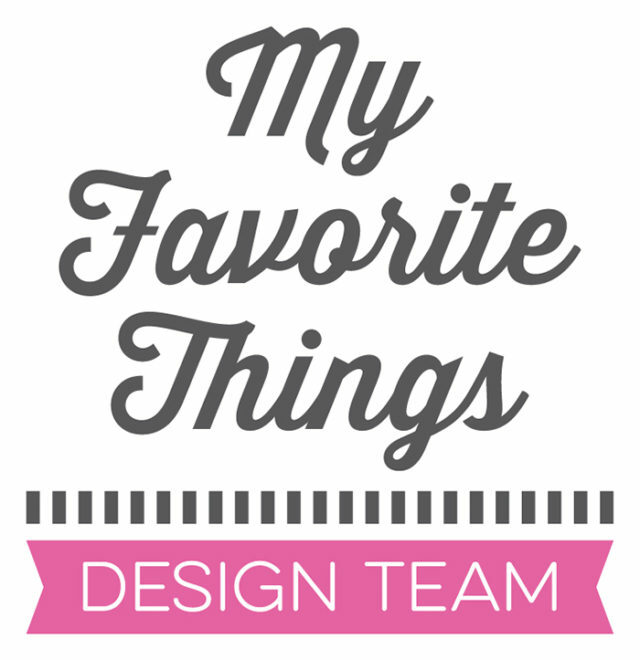 Excited that you are now part of the MFT design team. Already your cards have been such an inspiration. Thank you for sharing. Love the way you used the new tab builder as a window instead; very creative. Adorable card! Love the tag die incorporated into the card. Love these critters and the new tag builder! Your card is adorable Anna! Thanks for the inspiration! What a wonderful cute card! Amazing colouring! I love these new partying critters and tag builder! Your card is fabulous Anna! Thanks for the inspiration! The tilted frame added to the charm of the happy celebration! Congrats on being on the DT now, Anna! I absolutely love this card, it has such a fantastic design and your soft coloring is so pretty!! So cute. Ready to party. Such a cute card you’ve made! Love this stamp set! What a great idea you had to use the negative space of that tag die cut for a window! Thank you for the inspiration! What a cute card! I like how you tilted the window- great idea, gives the card so much interest! Your card is just darling this new birthday stamp set is too cute. You have done a great job with it. Love the subtle colors! Great card! Adorable! Love the use of the tag to create a window for your scene. Fabulous card! I love the dimension from the negative tag die cut! I love how the rhino is on the inside of the window and the other critters are on the outside. Anna, super cute card! The stamp set is so adorable! Love how you used the die for a frame, Anna & your coloring is awesome! Love your card!! Great card design and I like how you colored these cute critters. This set is so cute. Like how you used the tag die. Gorgeous card! I love how you used the tag die to create the window frame. Thanks for the inspiration. I love your card! What a great layout and great idea to tilt the die cut!